If you study speed development based resistance training, you've no doubt read the standard line, espoused by many, to 'never use more than 10% of bodyweight' when doing sled pulls. The logic is that any more resistance than that will compromise acceleration mechanics making the drill not only ineffective, but counterproductive. Well, the other day I got involved in a training discussion with a few of the lead clinicians from this summer's Complete Track & Field Clinic. It stemmed from an article on the topic forwarded to us by Harvard University's Marc Mangiacotti. 1. We use this type of training for our sprinters, hurdlers *and* jumpers. 2. There is a selfless exchange of information - no one is 'hoarding' their secret training strategies. Latif Thomas: I have never been much of believer in the '10% rule' and use heavy sled pulls on the regular despite 'everyone' saying not to go more than 10% of BW. So, in short, I feel vindicated. Then again, my sprinters can't accelerate to save their lives. So, I should probably look into that. Ron Grigg: I am a top notch “acceleration clinician” but we can’t accelerate either. So I’m with you. I’ve been creeping heavier and heavier. 20-30 lbs total with weight and sled on our kids that weight 115-145. I will use heavier weight for 10m sled pulls. If I have them go further, I lighten the load, as I think there is value to pulling a light sled out to 20 meters. Reuben Jones: The quality of acceleration means everything to me, so I try to help my athletes feel movements, range of motion, body positions as much as possible. I use 45 lbs for men, 25 lbs for women. I’ll take them out to 15-20 meters or until I notice a fall off in running form with 3 minutes of rest in between each. I’ll tend to see solid acceleration mechanics with heavier loads (30 lbs or +), but of course, they can’t hold that for very long. Thanks for including me in this wonderful coaches forum! Latif Thomas: I'm definitely in agreement with the point about heavy sleds being used for very short (10m) distances and lightening the load if you're going to go out beyond that. 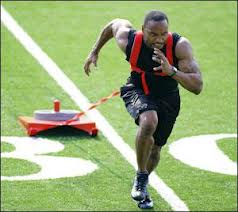 When you guys do your sled tows, do you tend to contrast it with flat surface runs within the same session or separate the resistance runs and the flat surface runs into different sessions? Ron Grigg: I contrast in 2 different ways. There are times where I go 1:1 sled:normal, and then there are times where I will do 3-5 sleds, and then 3-5 normal. Simply a matter of variation. Also, when I have hamstring issues, I will still do heavier sleds for 5-10m, as velocity remains low, and hamstring isn’t all that involved in the initial pushes. Marc Mangiacotti: I do the same thing Ron does. Sometimes I'll only have them use sleds while other times they will not use any sleds or weight vests. A contrast workout Ive used is 2 x 3 x 30m with light sled and 2 x 3 x 10, 20, 30. The athletes tow for a set then execute the flat acceleration runs for a set. I probably stole this from Ron. If find that the big push from the sled pulls carries over to the flat runs. It's kind of like an acceleration activator. Reuben Jones: I like to do flat accelerations on Monday, then resisted accelerations on Friday in the general prep phase. Special prep I’ll use 1:2 sled:flat in the same session. An ideal way to succeed as a coach is to learn from other successful coaches. You can do just that at the Complete Track and Field Summer Clinic, held at Harvard University this July!